Samanage scored exceptionally highly in our first ITSM ranking. The software earned an impressive total of 84 out of 100, gaining maximum points for both user reviews and application integrations. 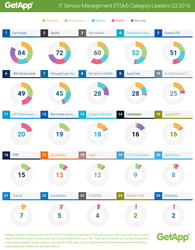 GetApp has unveiled its Category Leaders ranking of the top applications for IT service management (ITSM). Samanage comes out on top in the Q3 rundown, GetApp’s first ever ranking of ITSM solutions. The Category Leaders ranking assesses cloud-based software to give small businesses a first look at the top players in the IT service management market. GetApp’s software ranking is based on five different data points: user reviews, mobile app availability, integrations, media presence, and application security. A score out of 20 is given for each of these factors, making for a total score out of 100 for each application in the Category Leaders ranking. “Samanage scored exceptionally highly in our first ITSM ranking. The software earned an impressive total of 84 out of 100, gaining maximum points for both user reviews and application integrations. Congratulations also go out to SysAid and ServiceNow, which scored 72 and 60 points to place second and third, respectively,” says Suzie Blaszkiewicz, project manager of GetApp’s Category Leader ranking. Click through to see the full Q3 ranking of the top 25 IT service management software.